What Could Go Wrong with DIY Asbestos Removal? Avoid these 3 potential disasters by getting professional asbestos removal. If you are in need of asbestos removal, you may be balking at the cost of hiring a professional to handle the job. However, attempting this complex and risky job on your own could be far more costly, as you will likely make one of the following mistakes. 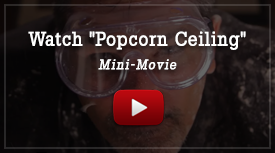 While asbestos is common in ceiling tiles, floor tiles, popcorn ceilings, siding, roof tiles, and adhesives of a certain vintage, it is not always present. Unless you know the brand name of every material used in your home throughout the decades, the only way to tell for certain which materials contain asbestos is with professional asbestos testing. When you choose H2 Environmental to manage your asbestos removal, you can rest assured that professional asbestos materials testing will be conducted in order to correctly identify the materials that need to be removed. This way, you don’t risk needlessly eliminating safe materials or unwittingly leaving hazardous ones in place. The chief danger of a DIY asbestos removal is that you may actually end up worsening the contamination by not using proper methods. For example, if you begin work without sealing off the area, asbestos fibers could drift all over your home. You could also spread contamination by wearing your work clothes around your home. You might not know to wet materials before handling, in which case you will create more asbestos dust than necessary. Finally, if you don’t use HEPA filtration when cleaning up after the removal, your vacuum cleaner will actually be spewing the dust you think you’re cleaning up back into the environment. At H2 Environmental, we understand the best practices for asbestos removal and we will ensure they’re followed to the letter on your job. 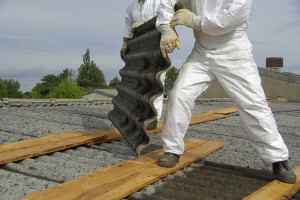 Most importantly, by conducting your own asbestos removal you may place your health in danger. You may not have access to the same kinds of high-quality safety gear that professional asbestos remediation workers wear, or you may not even realize you need this gear. You could expose yourself to significant amounts of airborne asbestos while working, which may increase your risk of mesothelioma or lung cancer to a far higher level than what you would have experienced if you’d just left the asbestos-containing materials alone. At H2 Environmental, we make sure our employees use all the necessary safety gear and remove this gear in a designated decontamination zone to protect their health and yours.